K100-forum.com » Off Topic » Humor » Spot the difference: Klones! 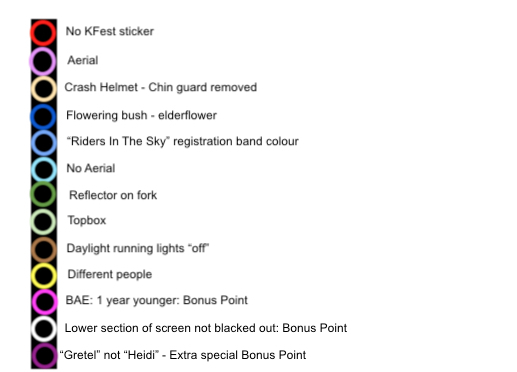 Can you spot the differences between the "Riders In The Sky" ride out pictures from 2017 and 2018? 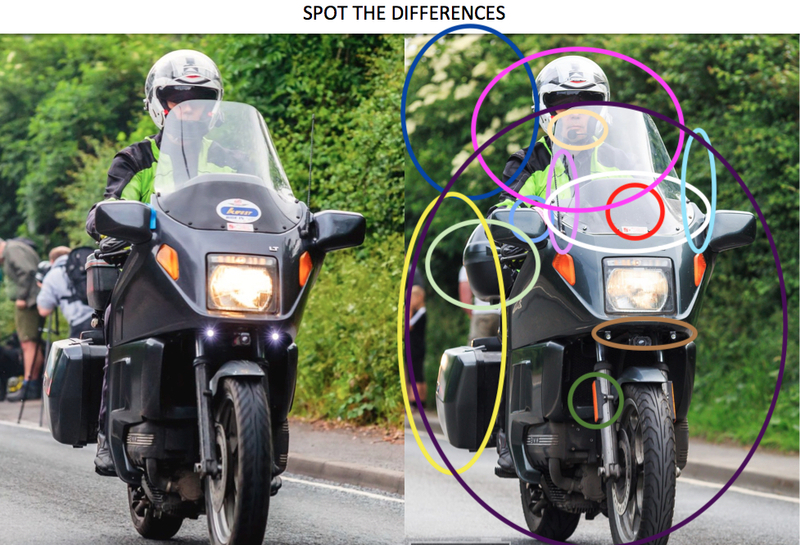 There are (10 obvious differences and 3 more subtle ones) - how will you score? Did you get them all??? There is also a different front tire. "Something" under the engine/in front of the rear wheel is missing. BAE Not Legend in first one, Legend in second one. @Ringfad wrote: BAE Not Legend in first one, Legend in second one. @svenok wrote: aerial..on the wrong side. The whole bike is on the wrong side. @kioolt wrote: There is also a different front tire. Well spotted! I put it down to a speed difference...but you're right, I'd forgotten that I had tried different tyres last year. Heidi (on left) is sporting a set of Avon Road Riders, Gretel (on right) is wearing out a set of Dunlop Arrowmax Streetsmarts. @blaKey wrote: Front axle rotated. Wow - eagle eyes blaKey! Reckon you were looking for the rogue white cable tie...but you're right, the front axle is in a slightly different alignment (glad I'm not too OCD on that front)! The "something" that you can just see against the black of the rear tyre on Heidi is an add on by a previous owner (rather than a missing from Gretel) - a stainless steel tube on a bracket that is bolted onto the centre stand - I guess it was workshop accessory to allow the bike to be lifted /supported. It's shiny, so it stayed. Hey hey!! Takes one to know one! Only a true Legend would have got that one. Yeah - Heidi's is on the left (which makes sense as the now long-gone radio was in the lefthand fairing pocket). Gretel, following our Nov 16 wreck got a "new" fairing courtesy of a cafe-hacker parting out his RT - for some odd reason, an aerial had been fitted on the right. Clearly a PO had suffered from a little LT-envy and popped a hole through the fairing to take an aerial...but stuck it on the wrong side. As I didn't need to paint the upper fairing assembly, there was no sense in removing the aerial and filling the hole. On both bikes - the aerial is a redundant accessory. The really eagle eyed would also have spotted that Heidi (LT upper fairing) has the vent flap/scoop for cooler summer riding whilst Gretel (RT upper fairing) does not. I took the vents off Gretel's mashed old fairing and thought about doing some careful drilling and dremelling to cut slots in her "new" fairing and fit them, but to be honest, it seldom gets that hot in the UK and they don't seem to make a lot of difference. @Inge K. wrote: The whole bike is on the wrong side. No! Finally, the great Inge K has got something wrong!!!! 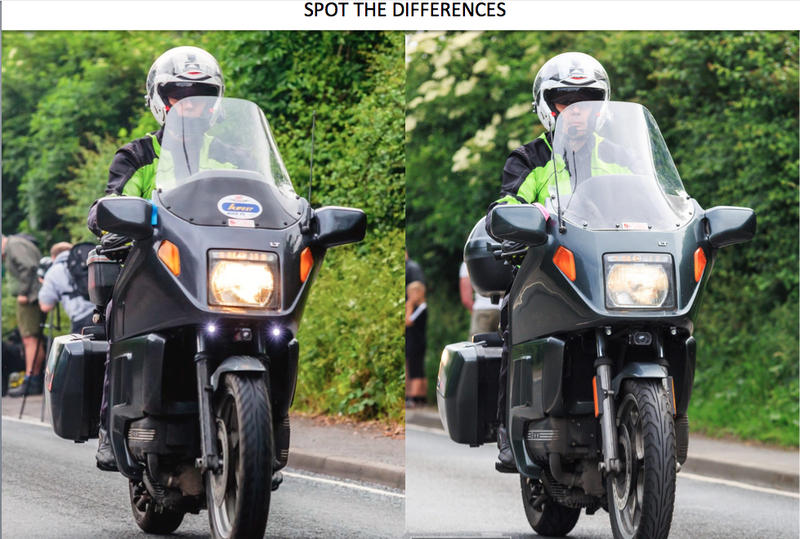 The bikes may be on the wrong side for you lot that ride on the right side of the road...but they are both on the wrong side, so that can't be a "spot the difference" difference. Minus 1 point for being invariably right nearly all the time. One more facial wrinkle on the new photo.